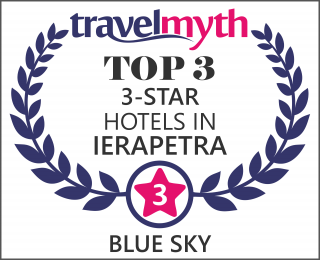 Welcome to Hotel Blue Sky - Ierapetra, Crete! There are a number of local attractions including Ierapetra Archaeological Museum and Ierapetra Venetian Fort. Blue Sky Hotel became operational in the summer of 1983 and was renovated in 2010. Located in the southern coast of Crete, 5 km from Ierapetra, opposite of the Island Chrysi. We offer a pleasant holiday in a beautiful setting. The construction of the main building is designed with beautiful Cretan style. It offers 24 comfortably furnished rooms with balconies overlooking the Libyan Sea. Standard rooms with air-conditioning ,mini fridge,direct dial telephone,USB wall socket (2.1A),satelite-TV,private safety deposit box,hairdryer and free internet access (wifi hot spot). The hotel is surrounded by beautiful gardens and a swimming pool, restaurant, reception and bar. It lies 150 meters from the sea and has a panoramic view. There is possibility of daily contact with the city bus service every hour.